Oooh, Shinies! : My first franken! The plan for today was to try out some of the sample pack I got, but I couldn't choose. And because I wanted to try out frankening for a while now, I decided to do that instead. I bought a backup bottle from the polish I used yesterday, and started to mix a bit on the plastic placemat that I use for all the polishing that I do (I think it's ideal, you can for example clean your stamp on it and wipe it off later). I tested the results on paper and got a nice color, I used around 50% Casuelle and 50% Color Club Worth The Risque mixed with a bit of China Glaze OMG. 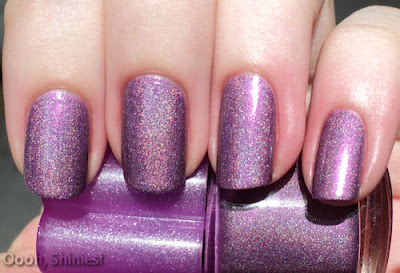 So I took the bottle and let out some polish until it was half full, and mixed in the Worth The Risque and OMG. 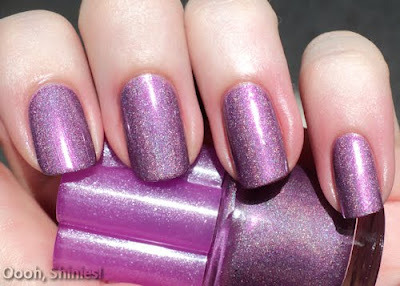 That looked like what I aimed for, but when testing it on paper again, it reminded me a bit of China Glaze BFF. I made it more dark by adding more of the Casuelle, and then I saw my new China Glaze Stella on my desk (gorgeous color, I might add), and added a bit of that as well. I got a lot of nice shades (and a weak arm from all the shaking), and stopped because else I'd continue for a lot longer with a little bit of this, and a little bit of that. I enjoyed doing it, and will get some more bottles sometime. 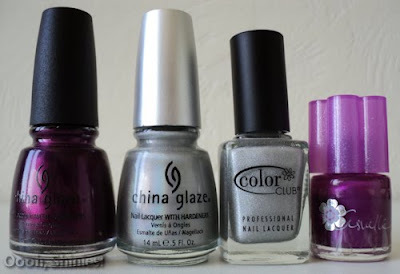 These are the polishes that I used. From left to right, China Glaze Stella, China Glaze OMG, Color Club Worth The Risque, and Casuelle purple. Tadaaa! I call it: Shiny No. 1. Yes, I lack inspiration at the moment, and I suspect there will be more of these in the future, so I'll just number them! 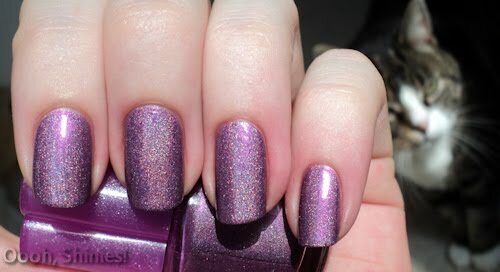 It's a purple with a purple/pink shimmer, and a light holo, which isn't as visible on the pictures as it is irl. It's a bit like the Color Club holos, but it was hard to capture, I guess that's because of the shimmer in it. The application was fine, and so was the coverage. I used 2 coats and I think I could even use it for stamping. The drying time was good too. Thanks for stopping by, have a nice day!